I see the number of customers constantly growing at the local organic food store in Rochester. This is not some fringe group of people, but they are your friends, neighbors and family. We all want to eat healthier, but many of us have the idea that organic gardening is difficult. You see and read everyday, how organically grown vegetables and fruits are good to eat. All of this, isn’t really as hard as you think it might be. 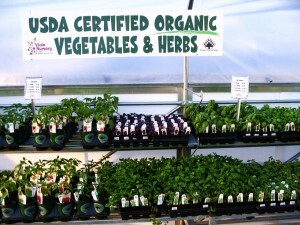 Vegetables especially, can be grown in a number of different ways and still be organic. Probably the easiest way is to grow them in some type of container. A container can be anything as simple as a flower pot, to something as large as a raised garden. In order to stay true to the organic concept, you need to start with organic soils. Luckily there are more and more companies that sell organic soils. My personal favorite is a brand called Organic Mechanics. It is an all natural soil with worm castings as a natural fertilizer. Along with an organic soil, you will need to look for organic seed or started plants. Vegetables that need warm weather to thrive are usually best purchased as plants. All of these items can be purchased at Viola Nursery and Greenhouse. We can also provide you with garden coaching to help you be successful. Growing organically isn’t any more difficult than using chemicals on your garden. With a little research, and a stop at your local garden center, you’ll be enjoying all the flavor and benefits of growing your own organic food.